Immediately we send you an adviser to estimate the different peculiarities of your removal. Later in Mudanzas Egara prepare an economic budget and we inform our logistics plan for transfer. After accepting the budget and before the removal is made, a contract is to be signed by the company and the client. In this document, price, date and responsibilities of the company are stipulated.. If deemed necessary, Mudanzas Egara will provide packing material before the transfer date for letting you pack your belongings in the manner it deems appropriate. 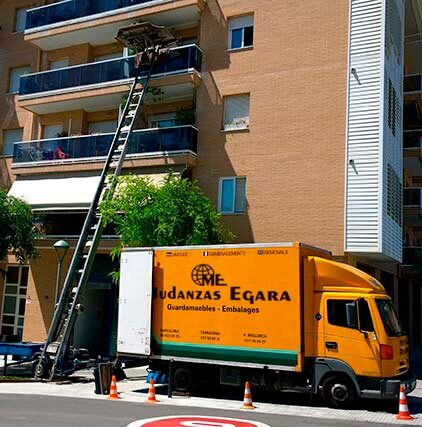 Finally the agreed day, Mudanzas Egara sent to a professional team of skilled operators to perform your move. In the realization of your move, packaging is an important part. 1- A professional service, which includes the packing of all your items: from your best dishes and glasswork, to the less delicate objects. 2- We can pack only the most delicate objects like dishes, glasswork, decoration objects, lamps, paintings, and you pack the less delicate items. 3- If you wish to pack yourself, delicate things or not, this will reduce the removal budget. But don’t worry if you have some special thing to be packed, because of it’s sentimental or economic value, on the day of your removal you only have to tell one of the operators, and he will pack this special item for you with pleasure, without any extra charge. In Mudanzas Egara realize the full removal of its dependencies. Building Move source to destination all his property: jobs, documentation, and any delicate object that is in his possession. We will assign the most suitable for the movement of its dependencies as quick and convenient as possible team.. When you trust your furniture to Mudanzas Egara you know that they are in good hands. However, sometimes the unexpected happens. It is for this reason that we respond to their belongings to a total of 15.000 euros. Anyway, if you wish to increase this amount, we offer you an additional insurance through our insurance company.